In the summer of 2007, the league announced an expansion team for the 2008 season: the Boston Blazers. There had been a team in the NLL (in its former life as the Major Indoor Lacrosse League) called the Boston Blazers from 1992-1997; this new team was not related to the old one but used the same name. An expansion draft was held in July 2007, and some of the Blazers’ picks were Patrick Merrill (first overall), Pat Campbell, Brian Langtry, and Jake Bergey. Langtry and Bergey were picked from the Mammoth and Wings respectively, and each was immediately traded back. Boston made some other moves and their team was coming along nicely until the NLL came very close to disappearing entirely. The league and PLPA (Professional Lacrosse Players Association – the union representing the players) had been trying to reach a new collective bargaining agreement for months, but talks broke down and no deal was reached. Finally in October, the league announced that because they had no agreement, they had no choice but to cancel the entire 2008 season. Many fans, myself included, thought that this was it: the NLL was done. The NHL may be able to survive missing an entire season but I wasn’t confident the NLL could. Talks continued even after the cancellation and less than two weeks later, an agreement was signed and the season was back on. But not without its casualties. Shortly after the cancellation was cancelled, a new schedule was released. The schedule was notably missing two teams: the Arizona Sting, NLL finalists the previous year, and the expansion Blazers. Both teams announced that they would not be participating in the 2008 season though they were never specific as to why, just “business issues” relating to shutting down operations due to the season cancellation. Both the Blazers and the Sting said that this was temporary: they would return for the 2009 season. In November 2007, the NLL held the weirdest dispersal draft ever. The remaining 12 teams chose players from Arizona and Boston. Each team could pick up to three players, and the remaining players would become free agents. The weird part was that players chosen from Arizona would return to Arizona after the season ended. Sting players chosen in this draft would be borrowed for one year and then returned. Since Boston had never played a game in the first place, Boston’s players were just dispersed with no promise of return. Dan Dawson was the first overall pick, heading from Arizona to Portland while Patrick Merrill, Boston’s first pick in the expansion draft, went second to the New York Titans. The 2008 season featured a four-way tie in the East, with the Wings, Bandits, Swarm, and Titans all finishing at 10-6. The Bandits eventually represented the East in the finals. In the west, the Mammoth and San Jose Stealth tied at 9-7 and the Roughnecks finished third at 7-9, but it was the fourth-place Dan Dawson-led Portland LumberJax who took the West. Dawson had yet to win an NLL Championship but had led the Arizona Sting there twice in the previous three years. The LumberJax couldn’t get by the Bandits and Dawson was denied a title yet again. After the 2008 season ended, as promised, all of the Arizona players were returned to the Sting. Portland had to say goodbye to Dawson, one of the top players in the game at the height of his career, and got nothing in return. Of course, they gave up nothing to get him and almost got a Championship out of it, so they couldn’t complain too much. I have always suspected that the Sting were losing money hand over fist and the 2008 labour dispute and season cancellation gave the Arizona owners the “out” they needed to fold up shop. They claimed difficulties in restarting things after the cancellation and that they’d be back next year, but I don’t think they ever had any intention of doing so. I have no evidence of that, it’s just a feeling, but sure enough, shortly after the 2008 season ended, the Sting announced that they were ceasing operations permanently. As a result, all of those players who returned to Arizona were part of yet another dispersal draft. The Blazers kept to their word and returned, grabbing Dawson with the first pick in that draft. Why the Sting players didn’t just stay with the teams they played for in 2008, I don’t know. A month after that dispersal draft, the league held its second expansion draft for the Blazers, in which Mike Poulin was chosen first. Oddly, the Blazers chose John Gallant from the Mammoth and then traded him back, just as they had done with Brian Langtry a year earlier. Even more oddly, they chose Jake Bergey from the Wings and then traded him back to Philly, exactly as they had done a year earlier. 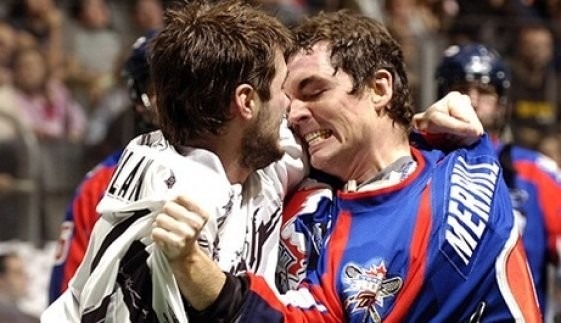 Bergey remains probably the only player in NLL history, possibly in sports history, who played his entire career with one team and yet was traded twice. Just weeks before the season started, the league lost another team when the Chicago Shamrox announced that they were closing up shop. The Blazers had first pick in that dispersal draft as well, choosing goaltender Anthony Cosmo. The Blazers finally made their NLL debut in the 2009 season, and they played three seasons. They finished 10-6 in 2009 and 8-8 in both 2010 and 2011 and made the playoffs but lost in the first round each year. They played their home games at the very expensive TD Garden but after 2011, decided they couldn’t afford it anymore and tried to find another arena. They were unsuccessful and “temporarily” suspended operations after 2011. Their suspended operations were just as temporary as Arizona’s, and we haven’t seen the Blazers since. In September of 2011, the team was dispersed in the most recent dispersal draft to date. Care to guess who was taken first? Yup: Dan Dawson was chosen by the Wings, making him the first overall pick in three different dispersal drafts. Not bad for a guy originally chosen in the 6th round of the 2001 entry draft. The Blazers dispersal draft was significant in that its effects were far-reaching and are still being felt. Dawson went to the Wings and was traded a year later to the Knighthawks where he finally won the Championships that had eluded him for years. Minnesota picked both Anthony Cosmo and Josh Sanderson; Sanderson was immediately traded to the Rock while Cosmo sat out for part of the 2012 season before being traded to the Bandits. Calgary picked up rookie goaltender Nick Rose, who was also traded to the Rock the next year. Mike Kirk and Casey Powell went to Rochester, and Greg Downing and Mitch Belisle went to Minnesota. But the draft picks that are still resonate in the NLL today were the two made by the Edmonton Rush: Kyle Rubisch and Ryan Dilks. The 2011 Rush were 5-11 and missed the playoffs for the fifth time in six years. 2012 saw Rubisch, Dilks, Brett Mydske (in his third year with the Rush), and Chris Corbeil and Jeff Cornwall, both traded from Buffalo, form the core of the Rush defense. The team finished 6-10 but made it to the final, losing to the Rochester Knighthawks. Those five players are still a huge part of the Rush defense and have led the team to multiple championships. It’s interesting that the stability we see in the back end for the Rush came at the end of one of the most unstable periods in NLL history. Between 2004 and 2008, five expansion and five dispersal drafts were held, and the Boston Blazers were involved with two of each. We had players drafted by one team, then drafted by another without ever having played for the first one. We had players drafted by one team, returned to the previous team like a library book, and then drafted again by a third team. We had one player picked first overall in three of them, and we had the current GM of the expansion San Diego Seals picked first in one and second in another. This article started as an @NLLFactOfTheDay. I wasn’t sure if it was going to be about Dawson being picked first in three drafts, or possibly Patrick Merrill being picked first in an expansion draft, which was interesting because he’s going to be doing the picking in the upcoming expansion draft. Then I realized that the whole story was really interesting and wouldn’t fit in a tweet. This entry was posted in Edmonton Rush, History, Minnesota Swarm, Philadelphia Wings, Rochester Knighthawks, San Diego Seals, Saskatchewan Rush, Toronto Rock, Trades. Bookmark the permalink. you forgot to mention the other imfamous lap dance the blazers cheer leaders gave the mascot their final season during a half time show!